You can change in DesktopOK the save options for the desktop icon layout name! 1.) ... Change options for the desktop icon layout name! 2.) ... Change desktop icon layout file name options! 1.) Change options for the desktop icon layout name! 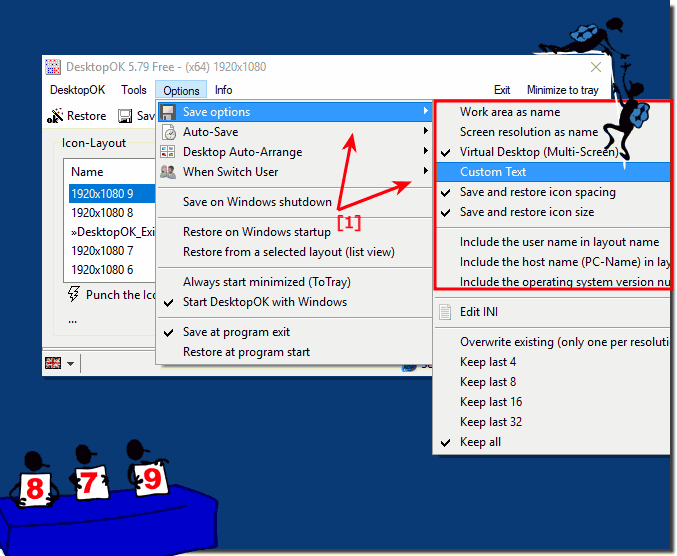 (Image-1) DesktopOK save options on Windows-10! 2.) Change desktop icon layout file name options! (Image-2) Desktop Symbols Layout File Name! 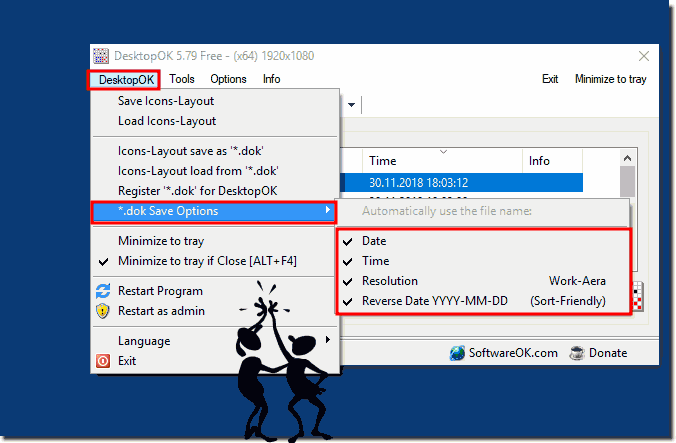 You can even see in a simple decision what the desktop icon layout should be called, or the layout name can become a bigger task in program development than the memory of the desktop icons. As you can see in Windows 10 shot screenshot above, here are some options to affect the Desktop Icon Layout Name, you can easily and safely use it on other and older versions of MS Windows operating systems, no matter if it is a Windows desktop , Tablet, Surface Pro / Go, or even a server operating system. It really makes sense and is beneficial for users to choose from the desktop icon layout name. DesktopOK - FAQ-19: Why DesktopOK save the wrong resolution of the Desktop?